FREE Party in Redlands Tonight! Come to the FREE Avant concert at UCR. Then if you’re looking for another FREE event, go to the Cancun Bar and Grill in Redlands. 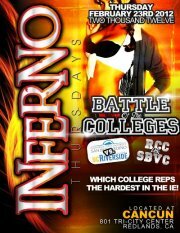 Here, they have “Inferno Thursdays”. Tonight’s theme is “Battle of the Colleges”. This event is FREE for all students who have a valid college ID. They have announced on Facebook that Bobby Brackens and Young Maestro will perform live! Click the link below so that you can RSVP and get FREE drinks and guest list privileges! This event is new to me; so if you go come back and share you experience with us!